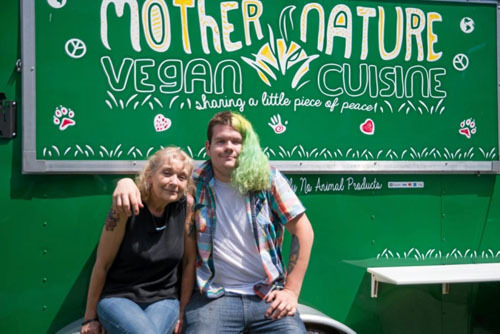 The Mother Nature Vegan Cuisine food truck is no more and its owner finds herself in the middle of a firestorm for insensitive comments about the people killed in the Las Vegas massacre. According to her calculations, each murder should save 155 animal lives per year — and that’s not counting any children the victims might have had but now won’t. It doesn’t occur to vegans that animals like chickens would not exist in the first place if we didn’t raise them for food. “Carnists” are people who do not deserve to live because they consume a normal human diet. She herself became a vegan 2 years ago. Delinda used to be an adjunct history professor at Marywood University. With her food truck in hiding because the predictable backlash from her incendiary remarks has frightened her, now might be a good time to resume her academic career. Delinda with her son/business partner Kyle.